I had lots of fun making this project and using the lovely �Fruitcake� range of Basic Grey papers. I�ve tried to think outside the square & create a round layout which I�ve offset with an easy & fun to make scalloped chipboard frame. This layout was created usingthe Basic Grey FCake Frosty Paper Pack, 12x12 plain chipboard or thick cardstock (and colour as it will not be visible), Heidi Swapp crimson florals, Heidi Swapp Rhyme lowercase ghost letters, 7 black brads, 2 extra brads (any colour as these will not be visible), black ink, approximately 30cm of ribbon, PVA glue or Jac paper, Magic mount, Basic Grey Wholly Cow Rub-Ons BEL492 and Scenic Route Beautiful Rub-Ons. You will also need a compass or something round to trace (approx 22cm diameter for the frame and 4cm for the scallops) - I have used a dinner plate and a milk bottle lid. Place a dinner plate over the centre of the plain chipboard sheet so there is an equal amount all the way around and trace the outline. Remove the plate. Place a milk bottle lid anywhere on the outside of the marked circle so that it touches the edge of the line. Trace around the lid to mark the first scallop. Position the next scallop by moving milk bottle lid clockwise around so that it just touches the outline of the first scallop and again is just touching the large circle. Trace the lid again. Repeat all the way around the circle. The end result should resemble a flower. Cut out the scallops with craft scissors or a stencil knife. I personally prefer to use a knife. Cut around each scallop from the point where the markings touch on the left side, around the bottom of the scallop and to the point where it touches the marking for the next scallop to the right. Continue around the entire circle. Carefully cut out the centre of the scalloped circle, keeping the middle section intact as this will form the base for your layout. Apply PVA glue or Jac paper to the top surface of the chipboard frame and adhere to the back of the �Berry Branch� paper. If using PVA glue allow several hours to dry before continuing to the next step. Trim away the excess patterned paper and/or jac paper from around the scallops and on the inside of the frame using a craft knife, keeping the paper from the centre of the frame intact. Lightly sand the edges of the frame with a sanding stick or light to medium grade sand paper. Ink the outside edges of the scallops with black ink. Put aside to dry. Cut a 8cm by 25cm piece of the �Frosty� paper and adhere to the cardstock circle base so that it overhangs the top, bottom and left side of the base by approximately 1-1.5cm. Adhere your 6 x 8 photo to the right section of the base, again allowing for at least the same overhang for the top and right hand side of the base. Using the reverse side of the �Berry Branch� paper offcut, cut a piece approximately 14cm by 18cm and tear the top edge. Adhere this piece to the base butted up to the �Frosty� paper and slightly overlapping the bottom of the photo, again allowing for a slight overhang over the base. Adhere the ribbon over the join created where the papers and photo meet, keeping it roughly at right angles to the torn piece of patterned paper. Place the frame over the covered base and adjust until you are happy with the balance of the layout within the frame. Using a pencil, lightly trace the inside of the frame onto the base. Leaving the frame in place, mark the innermost point of each scallop around the frame onto the base. Remove the frame and trim the base to the correct size by cutting it to a circle midway between the marked outline of the frame and the scallop markings. Adhere the frame to the base as per outline markings. To decorate the �Ghost Letters� select 2 or 3 rub-on flourishes and cut them individually from the main sheet. Randomly apply small sections of rub-ons to the top surface of each letter. Any excess rub-on can be removed by trimming carefully with a craft knife or lightly sanding the edge of the letter with a sanding stick. Working on a craft mat, punch holes in the ghost letters where brads are to be attached. Place letters on the layout as shown and mark positioning of the holes. Apply �Beautiful� rub-on to the layout as shown above. Punch holes in the layout and line them up with the holes in ghost letters. Attach with brads. Cut two snowflakes from the �Snowed In� paper and two snowmen from the �Frosty� paper. I have done this using a craft knife as I found it too fiddly for scissors. 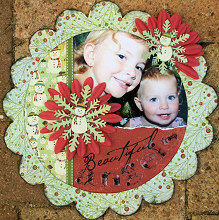 Layer one floral with the large snowflake and position on the layout as shown above. Punch a hole through the all three layers and attach with a brad. Fold the other floral in half, layer with snowflake and position as shown to the frame. Punch a hole through all the layers and attach with a brad. Finally, attach a snowman to each snowflake using magic mount for dimension.